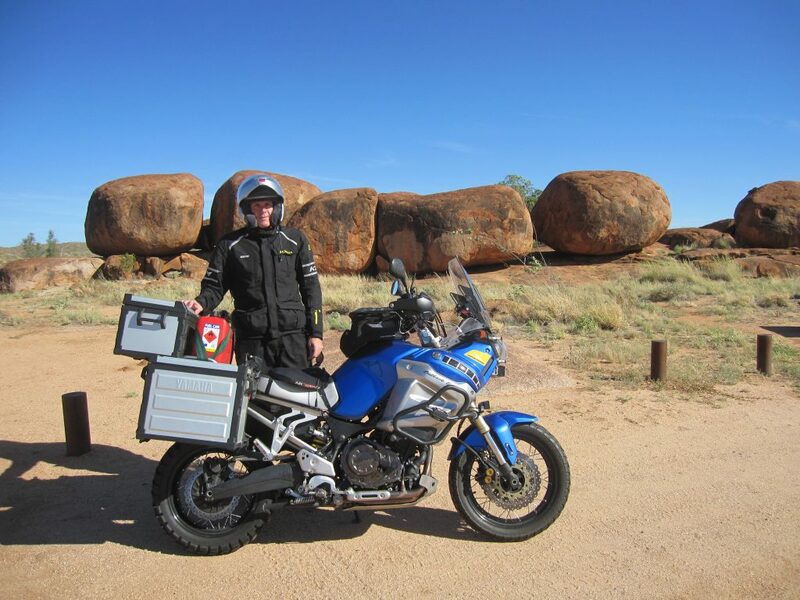 Up early at 4.15am this morning in Alice Springs, I had some breaky, packed the Super Tenere and headed to the 24HR BP Alice City for a fuel docket and start witness for today’s planned SaddleSore 1600K ride to Darwin. I rode in and there were a couple of Police chatting to a local who was persuaded to leave just as I was finishing filling the Super Tenere’s tank. “Why not?” I thought so over I went, introduced myself to the Police who were by then sitting in their car, told them what I was doing and asked for a witness signature. I got one! Gotta love the boys in blue! I then paid for the fuel and with docket and a starting time of 5.17am in hand still wasn’t sure how I was going to get the extra 110ks minimum to make the 1494kms between Alice Springs and Darwin into over 1600ks. The first fuel stop was Ti Tree. It was much quieter and less threatening than last time I was there. Some locals were trying to push start their car, others having loud conversations and some sleeping under the Ti Trees. I paid for the fuel and got out of there as quickly as I could. 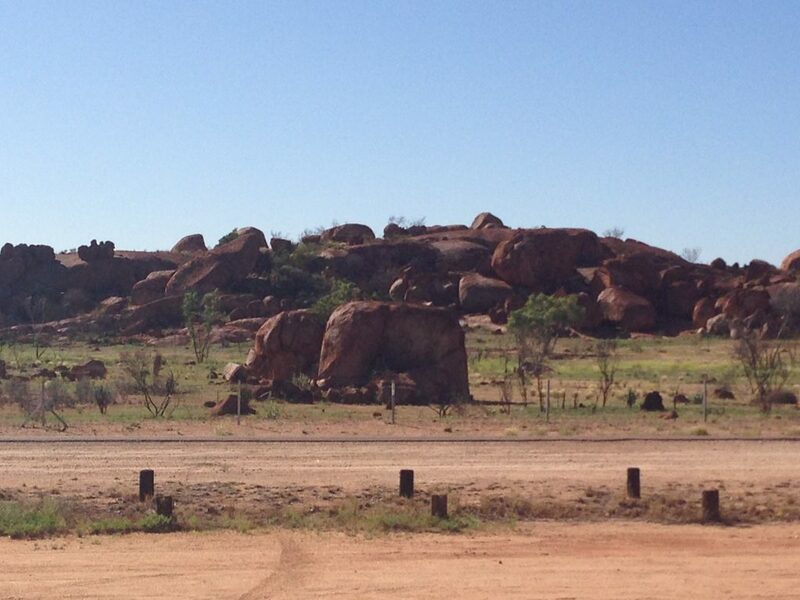 It was a beautful morning and I was enjoying the ride so much I nearly rode straight past the turnoff to the Devils Marbles where I needed to stop to take a FarChallenge Photo. That would have been pretty funny! I managed to turn in and while I was there a blue Commodore station wagon pulled in with three super models in it who asked me to take their photo, “No” they said, “with our camera not yours” … bugger! Anyhow, they must have thought I looked pretty good too, they took my photo, but not with their camera. The next fuel stop was Tennant Creek and not too far north I stopped for a photo of the sign near Three Ways. I’ve flashed past this sign a few time in the last year meaning to stop every time. Glad I managed this time. the Three Ways really is an intersection in the middle of nowhere. By then I had developed a plan to get the extra k’s in. I was going to ride to Elliott get a docket, turn around and ride 80km back to Renner Springs, get a docket and ride to Darwin. Probably a little bizarre but effective. I have to admit it felt very odd to be riding in the wrong direction, passing by all the trucks and cars I’d overtaken and catching them again later. The things we Long Distance Riders do! 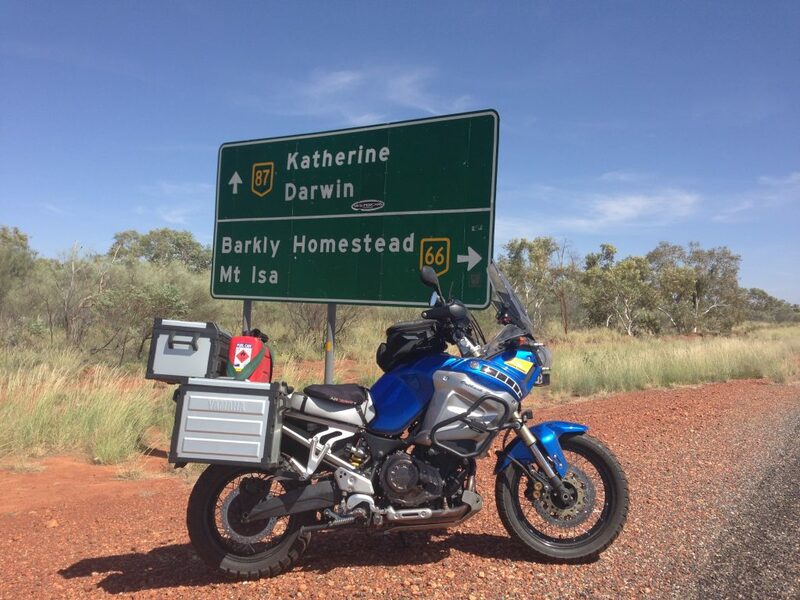 The day started to heat up, after my little loop I stopped at the Hi WayInn near Daley Waters and called Ozrider in Darwin to confirm where we might meet up. He asked what the temp was and I replied about 40. When I had finished my Icy Pole I looked at the Air Temp readout on the Super Tenere and it said 46. No wonder I was hot. I kept it showing for a while as I left town and it did drop a few times to 43 when the sun was covered by clouds. I was sucking in fluids, had some food but could feel the strength draining from me from the heat and growing humidity. 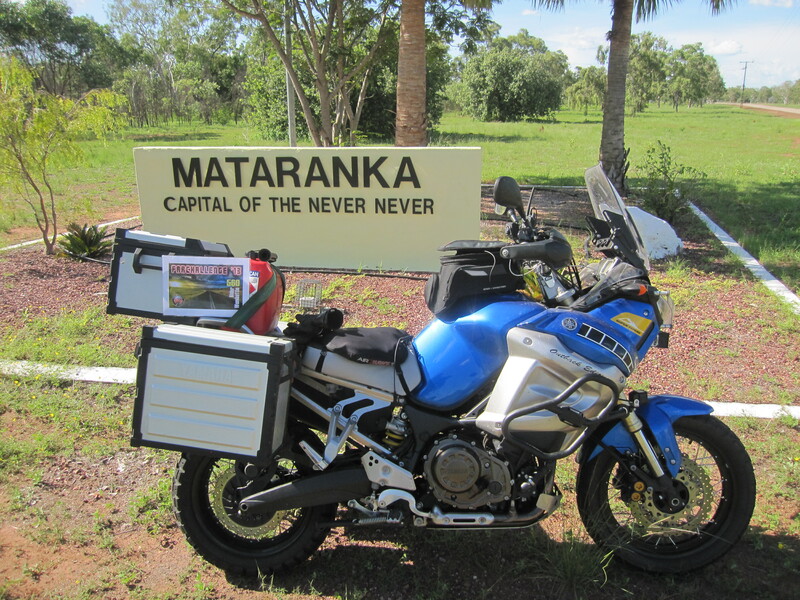 I got back onto the bike as quickly as I could and headed for Katherine for more fuel, drink and some time in the aircon at the Shell servo. There I gave my wife a call and asked her if she could find somewhere for me to stay in Darwin near the shops because I was going to need to buy a suitcase in the morning to pack my gear in to take home on the plane. I can’t understate what a help my wife is to me on these rides, particulary in situations like this one where I left on a moment’s notice without any planning done. Then he led the way north to the United servo in Darwin where he produced an end ride witness form. Soon after I was docketed and signed up and we were celebrating with Cherry Ripes. SS1600k done and even with the stops it was a touch under 16 hours. Gotta love the 130kph speed limits up there! The plan was to have a beer but first check into the Darwin Central Hotel that my wife had booked me it to. Ozrider showed me where the hotel was and when we arrived there he helped me get my gear up to the room. I looked in the Mini Bar, opened a couple of Crownies and then we worked our way through the beer (leaving the lite), the JD, Rum and Red wine chatting about rides we’d done, (including a very sound Centreline 24 he’d completed recently), bikes and FarRider stuff. Then it was after 1.30am, time flies when you are having fun. Ozrider went home, I crashed and burned.